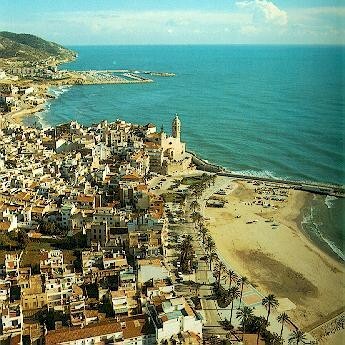 Sitges is situated 36 kilometres to the south from Barcelona with a population of 20.000 ( census January 2000) which increases to 60,000 during the summer peak tourist season. Sitges was originally a fishing village situated in the region Garraf, but now enjoys excellent (but disappearing) beaches and one of the best tourist infrastructures in Spain. The Sitges economy is mainly based on tourism and industry (the construction industry and the cement factory, and the stone quarries in Garraf). Tourism is mainly concentrated in Sitges, which offers excellent premises and services, and three marinas. Sitges has become a commercial centre with a great influx of tourists during the whole year. As a result, the construction industry has experienced a boom in second homes and houses for seasonal tourists.